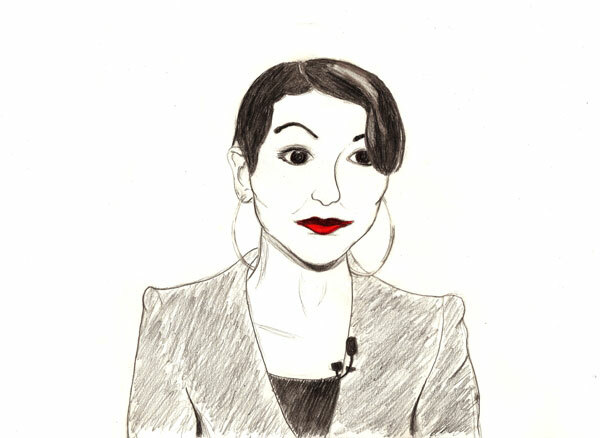 Anita Sarkeesian, looking sharp at her TEDxWomen Talk about Online Harassment & Cyber Mobs. This post is just a shout-out, or an homage, or a what-have-you, to say that Anita Sarkeesian is an epic badass. So, for those of you who don’t know, Anita Sarkeesian is the creator of the online video series Feminist Frequency and she is basically the Internet’s Bill Nye for feminism. In her series, she discusses the treatment of women in and by the media, explains feminist terminology and deconstructs the (often harmful) tropes used in the presentation of female characters. She explains her findings and her arguments in an accessible, step-by-step way, which is usually augmented by visual aides in the forms of still images, clips and bullet points. I like her videos a lot, and my favorites are generally those in her series (sub-series? ), “Tropes vs. Women.” As most of the Internet knows by now (it seems), not-too-long-ago, Ms. Sarkeesian began a kickstarter campaign to raise funds for a new line of videos, “Tropes vs. Women in Video Games.” And something happened. A particularly nasty sub-community of gamers (who represented as predominately male) took offense. Lots of offense. All the offense. A quite staggering and bewildering amount of offense, really. And these . . . enthusiasts . . . began a campaign of their own, to discredit and revile both Ms. Sarkeesian and the project through a torrential rain of misogynistic online harassment. And you can still find a lot of it out there if you want to look, and Anita Sarkeesian saved some of it so you can find it through her website, but I don’t feel like going into the details here, as looking at all of that vitriolic, threatening bullcrap for too long makes me feel all depressed and queasy. I don’t like bullies. ** My own experiences of being bullied in school have stayed with me well into my adulthood and they’re not just a memory. They affect me. They manifest in both emotional and physical ways, as trust issues and stress-related disorders and other lovely things that I will not go into now. As a result, however, I have a lot of admiration for someone who can stand up to bullying on such a massive scale, and who has the drive and ability to step back and turn something so potentially poisonous into a teachable moment. *No, I won’t link to it. Why would I do that to you? Last I checked, it had received under 700 views, anyway. Let’s do our best to keep it that way. **Feel free to imagine Danny Phantom‘s ghost kid Sidney Poindexter (from “Splitting Images”) wailing “Bullies! . . . Bullies!” here. I know I do.